That’s brake cleaner under the rotor and not brake fluid, if you were concerned. I thought that it was time to change the brake pads on my 2008 Impala. Unfortunately, the front pads were only about half worn and the rear pads still had a little bit of life. Since I’d already had the wheels off at that point I went ahead and changed them anyway. Considering that the sets of front and rear pads together only cost about $55 I wasn’t really out much (and in the long run I’m not out anything anyway) and I did learn a couple of things in the process that may prove useful later. I didn’t bother to document the process but it wasn’t much different than changing the brake pads on our 2006 Scion tC (except this time I did it right and lubed the caliper bolts). Updated 05/31/2012: Part of the reason I decided to change my brake pads now was because I planned to take my car to a shop for new tires and an alignment. I did take it yesterday and had four new tires put on it. That was a little different; usually I can space out replacements so I’m only changing one pair at a time. Before any of this work was done I had started to notice something that I can only describe as a slight rotation or wobble, which was much more noticeable in the rear of the vehicle. 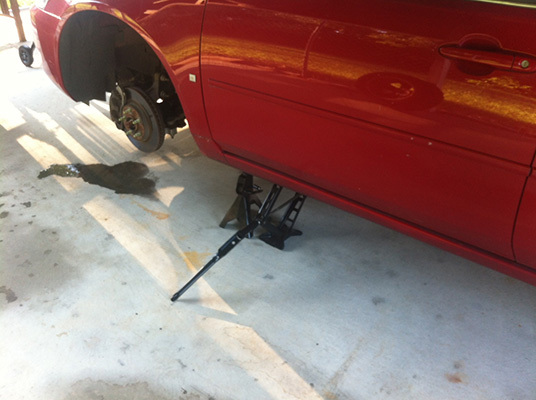 I knew it was time for a front-end alignment due to uneven wear on the front, passenger-side tire. This was also part of the reason I had to replace all four tires. The rear tires were already in need of replacement and the one front tire was going bad. I wondered if I also needed a rear-end alignment. It wasn’t until we had the same done for my wife’s car that I knew this was needed from time-to-time on some vehicles. According to the shop my car can have the rear aligned, which they did. The rotation/wobble I had been noticing is gone. I suspect the rear was out of alignment but the mechanic at the shop had also mentioned that a bad or out of balance tire could be the cause. Regardless, the car is driving much better than before. Perhaps some time this year I’ll be able to afford to replace the suspension in the vehicle. At that point it should ride like new.